And Barbara Quinn is skeptical about the “strangely misshapen” sizer boxes that are used to measure bags, which some other readers said don’t readily accommodate odd-size bags that are otherwise of reasonable size, like some backpacks. So let’s not forget traveling musicians. A violin, viola or saxophone case does not fit in the standard sizer, for example. “My son is the violist of an internationally renowned string quarter. He travels about twice a month, all over the world,” said Judy Amory. It would be folly to consign a valuable, fragile instrument like that to the checked-bag system. “Musicians are an obvious category where one-size-fits-all simply cannot work,” she pointed out. 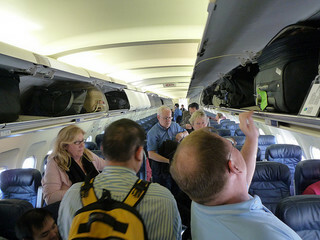 And of course, consider flight attendants, referees of the bag wars as they mediate passenger disputes and often physically hoist and pound bags into crammed overhead bins.